appearing Live on Stage in the Napa Valley! 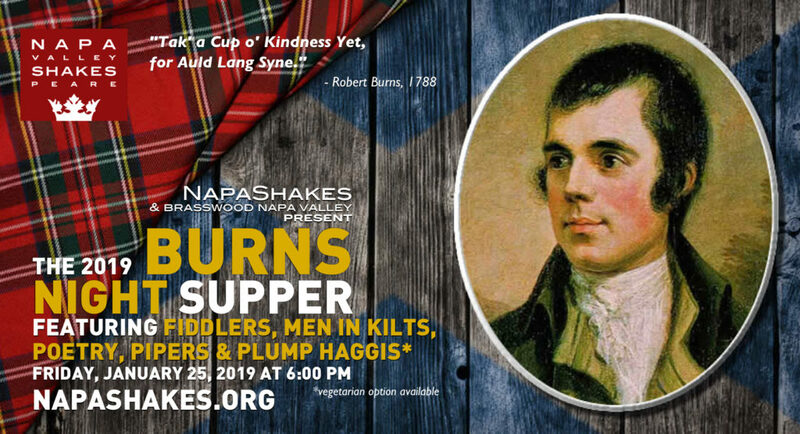 On Friday, January 25, 2019, NapaShakes celebrates the birthday of Scotland’s Bard: Robert Burns, and the music, food and culture of Scotland,with its first ever Burns Night Supper. 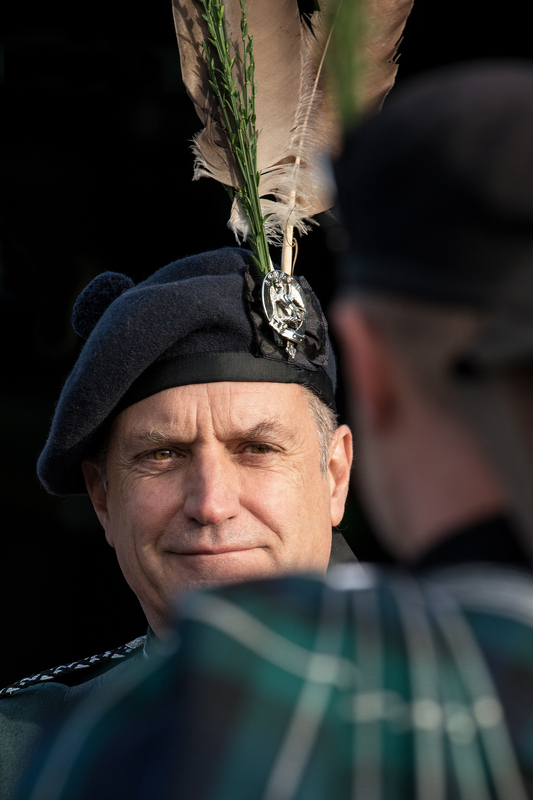 Guests will savor the words of Scotland’s greatest poet (and a bit of Shakespeare’sMacbeth) accompanied by bagpipes and a lively Ceilidh band, plus engaging performances by two acclaimed actors from the Bay Area to Broadway: Bonnie Akimoto and Victor Talmadge. 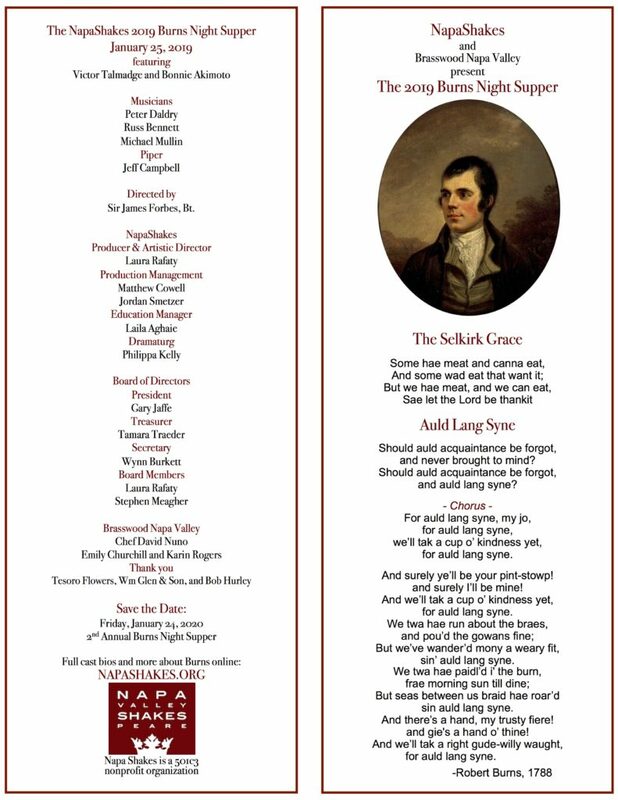 The evening includes a delicious Napa Valley-style feast with traditional haggis (meat or vegetarian), neeps and tatties, and other delights in the candle-lit Gallery of St. Helena’s Brasswood Napa Valley. The event is for age 21 and older, and attendees are welcome (but not required) to wear kilts and other traditional attire. 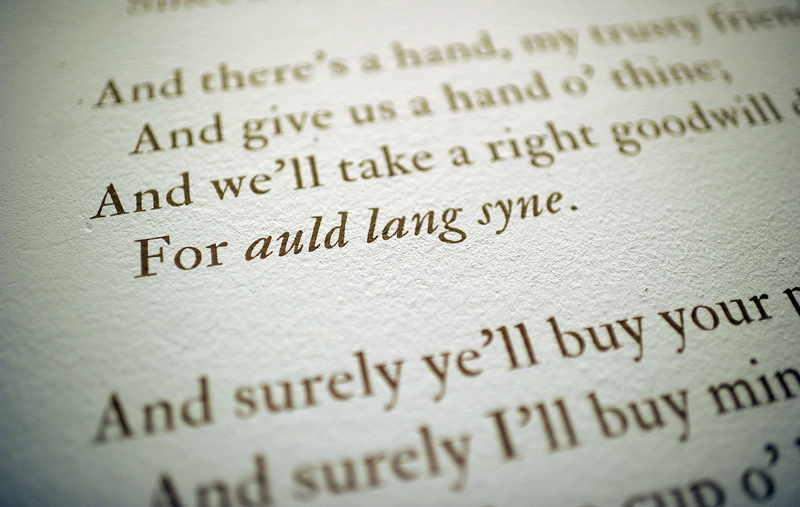 Each $100 ticket (per person) includes the Burns Night festivities, dinner, wine, and a wee dram (of whisky). Tickets are available on Eventbrite and through linkson the NapaShakes website.The evening is directed by Sir James Forbes, Chieftain of Scotland’s popular Lonach Highland Gathering & Games (www.lonach.org), and has overseen numerous Burns Night Suppers both in Scotland and in the United States. 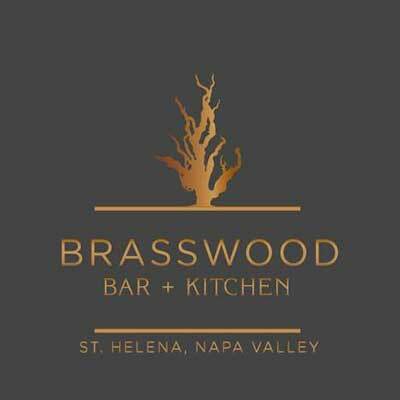 The event is presented by NapaShakes and by Brasswood Napa Valley, located at 3111 Saint Helena Highway North, in St. Helena, off of Highway 29 between downtown St. Helena and Calistoga. Capacity for this seated dinner and performance event is extremely limited. Three Course Dinner includes (subject to change): passed starters, a Scottish salmon with greens and other goodies, haggis (regular or vegetarian) with lamb chops (or vegetarian mushroom ravioli alternative), neeps and tatties, and a delicious dessert. Please select your ticket based on your choice of the regular or vegetarian menu. An appetizer wine and glass of wine at dinner, plus a wee dram of whisky, are included. Additional wine, whisky and beer available for purchase. Ready to get your kilt on for our January 25 Burns Night Supper at NapaShakes? Rent a kilt, sash or other finery at William Glen & Son, 360 Sutter Street San Francisco, CA – 1-415-989-5458 (Mon: 9-6, Tues-Sat: 9-8, Sun: 11-5). http://wmglenusa.com/kilt-rental. Mention NapaShakes for a special discount! 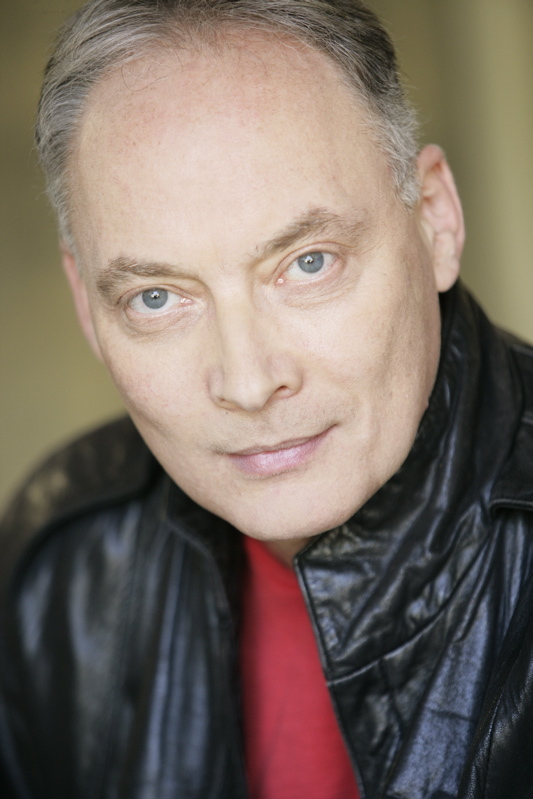 Victor Talmadge is a versatile Bay Area-based actor, director and playwright who has appeared in featured roles at Cal Shakes, Z Below, Berkeley Rep, ACT, Theater Works, The Aurora, SF Playhouse, The Magic Theater, and Santa Cruz Shakespeare. He has worked extensively in regional theaters, at Canada’s Stratford Festival, and appeared on Broadway in the world premiere of David Mamet’s, November. He played “The King” in the Tony Award winning production of the Broadway National tour of The King and I(originally opposite Hayley Mills) for which he received the Bay Area Theater Critics Award, and was seen as “Scar” in the Los Angeles production of The Lion King. Talmadge boasts extensive film and television credits, including a recurring role on the TV series, Manhattan. An accomplished playwright, his play: The Gate Of Heavenwas awarded The Nakashima Peace Prize, was the first live theater to be presented at The U.S. Holocaust Memorial Museum in Washington DC, and has been subsequently performed at The Old Globe Theater, Fords Theater, and The Annenberg Center, as well as various venues around the country. 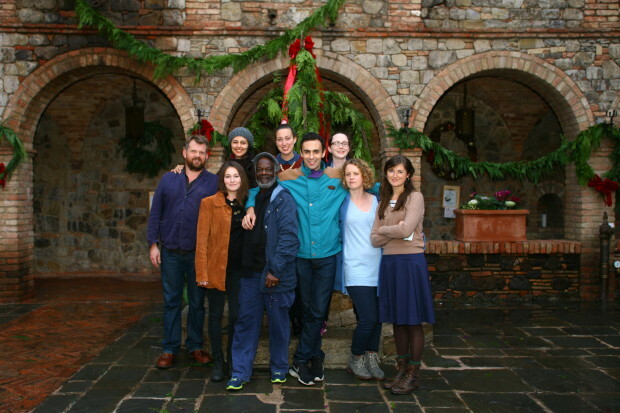 Talmadge is currently a Professor and Director of Theater Studies at Mills College. 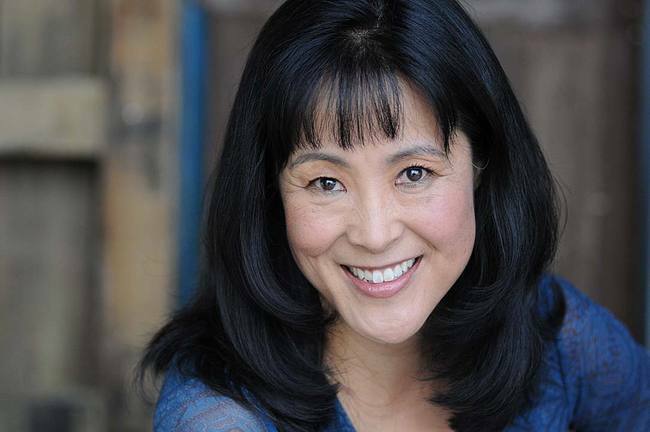 Bonnie Akimoto was most recently seen by Bay Area audiences as Madame Ho in the premiere of Eugenie Chan’s play of the same name. Bonnie has performed extensively with many Bay Area theaters such as TheatreFIRST, the Aurora Theatre Company, San Jose Stage Company, TheatreWorks, California Shakespeare Theater and Berkeley Rep among others. Outside of the Bay Area she has performed with such companies as the Oregon Shakespeare Festival, Mixed Blood Theatre Company, Fords Theatre and at the Contemporary American Theater Festival, Kennedy Center for the Performing Arts, and the Taganka Theatre in Moscow. Bonnie was awarded the Bay Guardian Goldie Award in Acting, a Dean Goodman Choice Award, and was nominated for a Bay Area Critics’ Circle Award. Bonnie now helps companies and leaders around the world through her work with Stand & Deliver, a global communication, culture and leadership consulting company based in San Rafael. Sir James Forbes, is Chieftain of Scotland’s popular Lonach Highland Gathering & Games (www.lonach.org), a documentary filmmaker, and creator of the Dramophone Whisky app (www.bearshead.com). Forbes and his wife Kerry live in St. Helena, California. 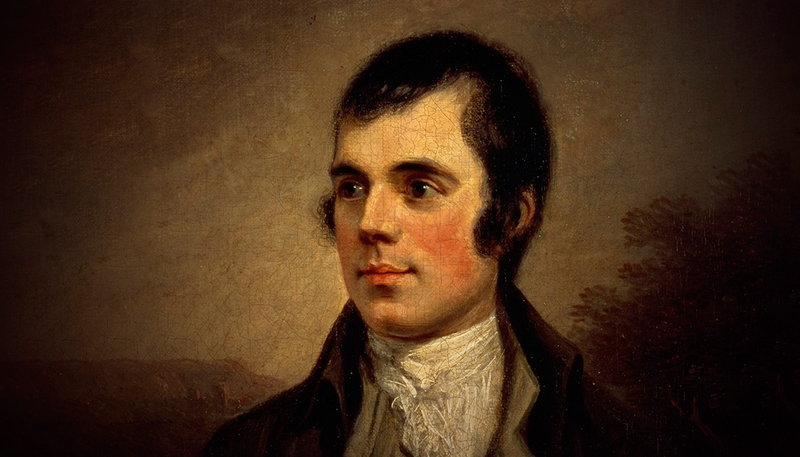 Robert Burns (January 25, 1759 – July 21,1796), also known as Rabbie Burns, the Bard of Ayrshire, and the Ploughman Poet, was a Scottish poet and lyricist. He is widely regarded as the national poet of Scotland, is the best known of the poets who have written in the Scots language, and is considered a pioneer of the Romantic movement. Celebration of his life and work achieved near cult-status during the 19th and 20th centuries, and his influence has long been strong on Scottish literature. As well as creating original compositions, Burns also collected folk songs from across Scotland, often revising or adapting them. His poem (and song) “Auld Lang Syne”is often sung at Hogmanay (the last day of the year) in Scotland and on New Year’s Eve in the United States, and “Scots Wha Hae” served for a long time as an unofficial national anthem of the country. 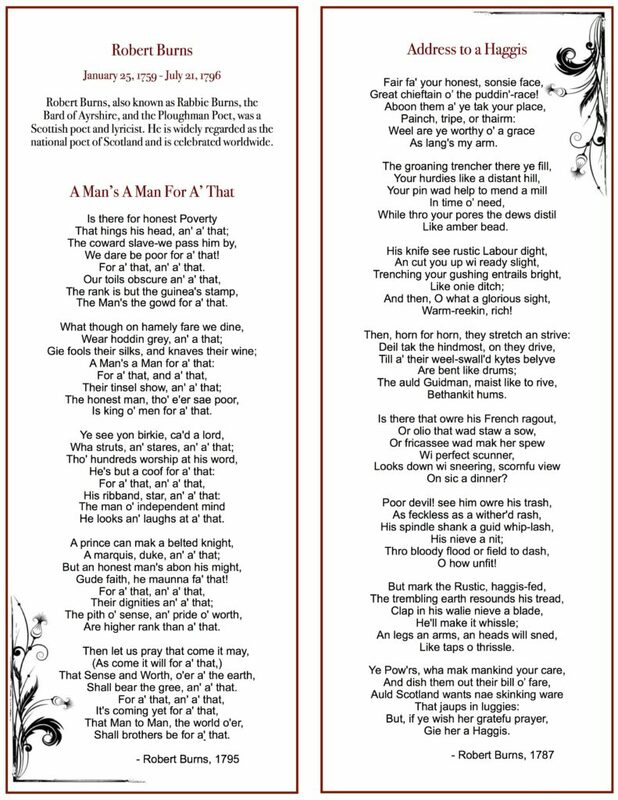 Other poems and songs of Burns that remain well known across the world today include “A Red, Red Rose,”“A Man’s a Man for A’ That,” “To a Louse,” “To a Mouse,” “The Battle of Sherramuir,” “Tam o’ Shanter,” and “Ae Fond Kiss.” He died of heart disease at the age of 37. Brasswood Estate, Napa Valley’s Wine & Food Village, is a one-of-a-kind wine and food destination offering multiple wine tasting experiences along with spectacular dining and shopping. Brasswood complements its contemporary winery and tasting room with two unique dining experiences: Brasswood Bar + Kitchen and Brasswood Bar + Bakery. Its Gallery showcases beautiful artwork, and hosts a variety of events and celebrations. For further information visit the website at www.brasswood.com. 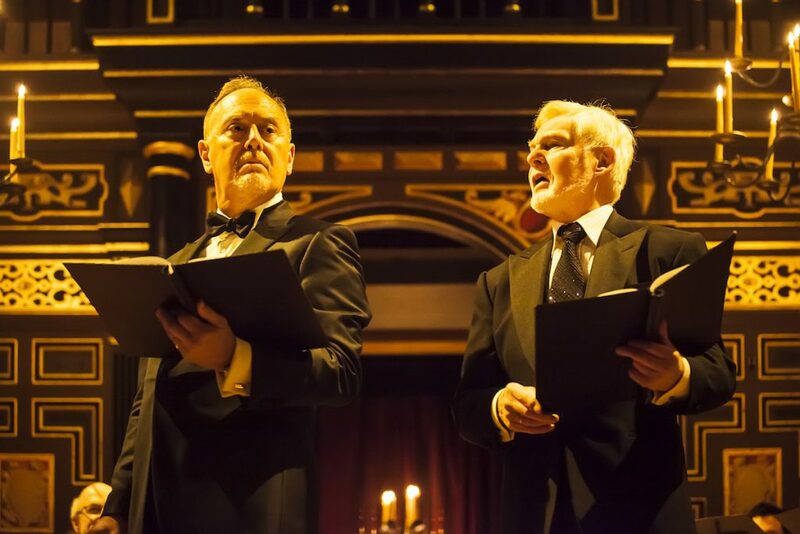 Renowned actor Derek Jacobi stars with actor/director Richard Clifford and the acclaimed early musicians of Washington DC’s Folger Consort in a World Premiere event celebrating the 400th Anniversary of William Shakespeare’s legacy. Presented by NapaShakes and the Folger Shakespeare Library, this extraordinary production combines dramatic readings of Shakespeare’s Measure for Measure with excerpts from Henry Purcell’s chamber opera Dido and Aeneas to create a perfect depiction of the ecstasy and excesses of love. With a cast of 27 including Peter Becker (baritone), Molly Quinn (soprano), and Emily Noël (soprano), don’t miss the first performances of this historic pairing of two monumental works, starring one of the world’s most respected and beloved actors, before it moves to the Kennedy Center. Shakespeare’s play Measure for Measure and Henry Purcell’s chamber opera Dido and Aeneas dramatize the conflict between public duty and private passion. Angelo’s commitment to Vienna is tested by his lust for the virtuous Isabella, while Dido’s passion for Aeneas threatens her rule of Carthage and delays his destiny as the founder of Rome. In Measure + Dido, Purcell’s Dido is used as a “play within a play” or interludes within an abbreviated Measure for Measure. Consider it a bold new, concert performance of one of the great early music operas presented as a masque within a framework of Shakespeare’s comedy. It has historical significance as Charles Gildon’s adaptation of Measure for Measure was staged at Lincoln’s Inn Fields in 1700, and this was also the first London staging of Purcell’s Dido and Aeneas. Folger Consort has a long and rich history of collaboration with actor Derek Jacobi and director/actor Richard Clifford. The Consort performed The Fairy Queen in 2007 with period orchestra and readings from A Midsummer Night’s Dream by actors Lynn Redgrave, Sir Derek Jacobi, and Richard Clifford. In 2010 The Tempest was adapted for one of these popular performances—with one special performance in Strathmore; remounted in Summer 2011 (with the Folger Consort’s performance score, Clifford’s direction, and Jacobi’s participation) in New York and in Santa Fe. 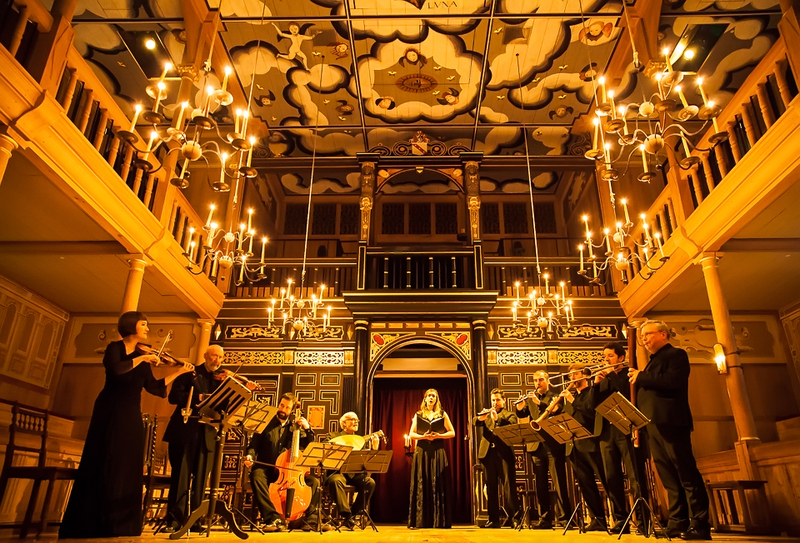 The 2015 collaboration which paired The Merchant of Venice with music of the Venetian Bassano family was performed at Shakespeare’s Globe, London. Thank you to our generous Measure + Dido Sponsors! A trunk becomes a ship. A sheet becomes a sail. 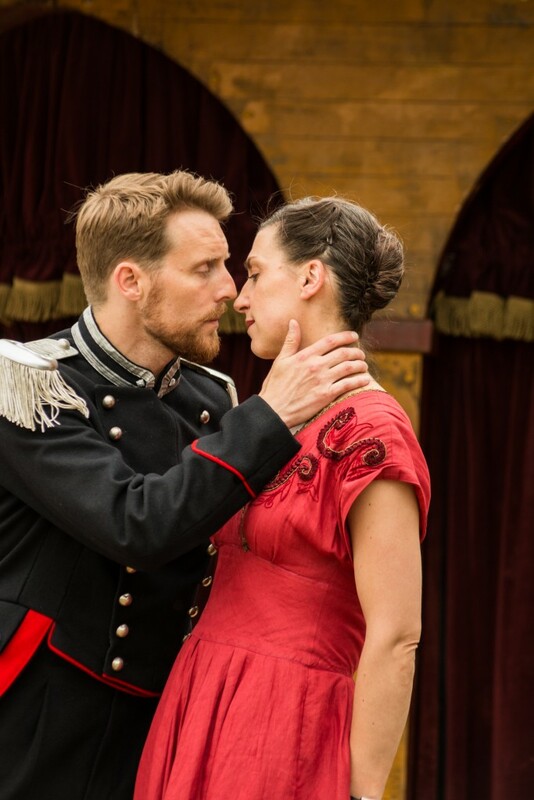 Poisoning, beheading, cross-dressing, and betrayal become fresh and frisky thanks to New York’s acclaimed Fiasco Theater’s inventive production of William Shakespeare’s epic comedic romance Cymbeline. Set in Ancient Britain during the Roman invasion, Cymbeline tells of a beautiful princess separated from her beloved, the cruel stepmother who tries to foil her, a credulous husband duped by an adversary, and an exiled nobleman who kidnaps a king’s sons. A young ensemble of six versatile actors resolves the twisted fates of 14 characters at lightning-speed, with live music from a cappella to bluegrass. 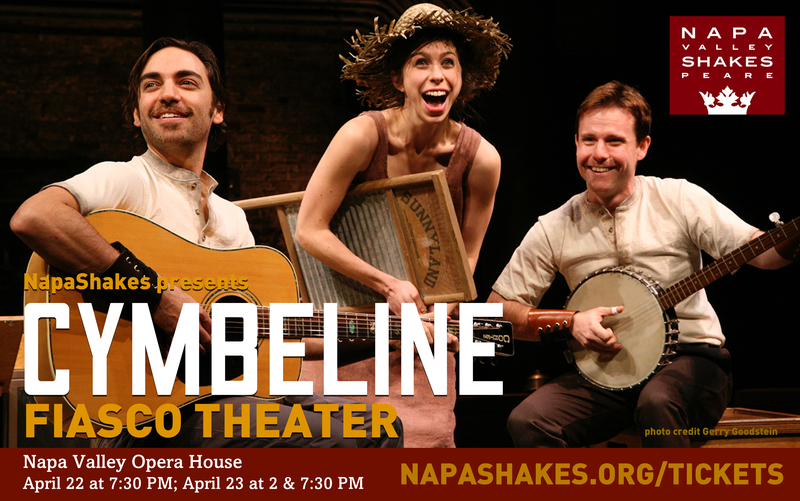 A sold-out smash in New York, don’t miss this exclusive West Coast engagement of what The New York Times’ Ben Brantley called “The most truly enchanting Cymbeline I’ve seen.” Part of NapaShakes’ Shakespeare400 Celebration. More at: napashakes.org. WWW.NAPASHAKES.ORG/TICKETS ~ tickets on sale now! 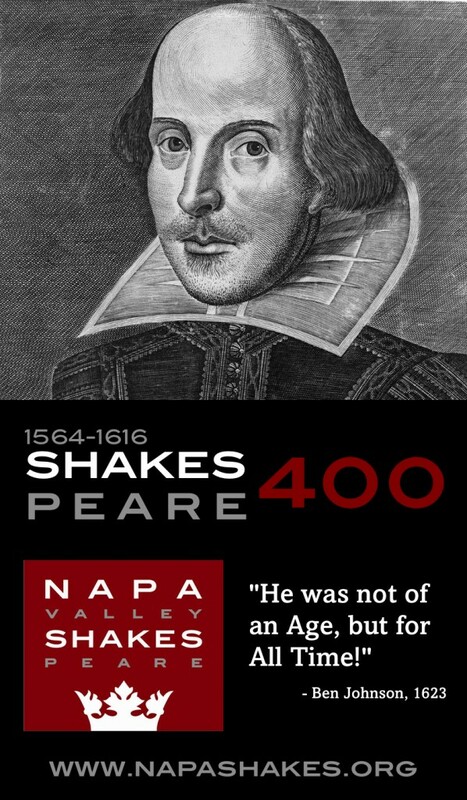 Part of NapaShakes SHAKESPEARE400 Celebration Weekend April 22-24, 2016! PLUS a special Encore Screening at the Cameo Cinema on Sunday, April 24 of Globe on Screen: “Twelfth Night” starring Mark Rylance and Stephen Fry. And more thrilling Live Performances planned for the weekend of September 24-25, 2016 featuring one of the world’s greatest interpreters of Shakespeare. Details soon! Stay tuned via our Facebook page and sign up for our Mailing List to hear when tickets go on sale – and remember that Donors always get First Dibs on tickets! NAPASHAKES has a variety of productions and programs in the works, including a star-studded play inspired by Abraham Lincoln’s lifelong love of Shakespeare, a staged reading helmed by one of Broadway’s most acclaimed directors, a symphonic performance of music inspired by Shakespeare conducted by a legendary Maestro and narrated by a film legend, a thrilling presentation for students performed by one of the country’s most prestigious theatre conservatories, a lively speaking engagement by a foremost authority on the language of Shakespeare, and solo shows by the world’s greatest interpreters of Shakespeare to be held in the courtyard of the Castello di Amorosa. Plus more Shakespeare’s Globe Theatre from London! Ended ~ our 2015 Season! The Reviews are in…read them here! Read complete show playbill and the official Globe Theatre programme. See an assortment of images from the Live Performance Photos Here! And find yourself and your friends at the Cast Party! 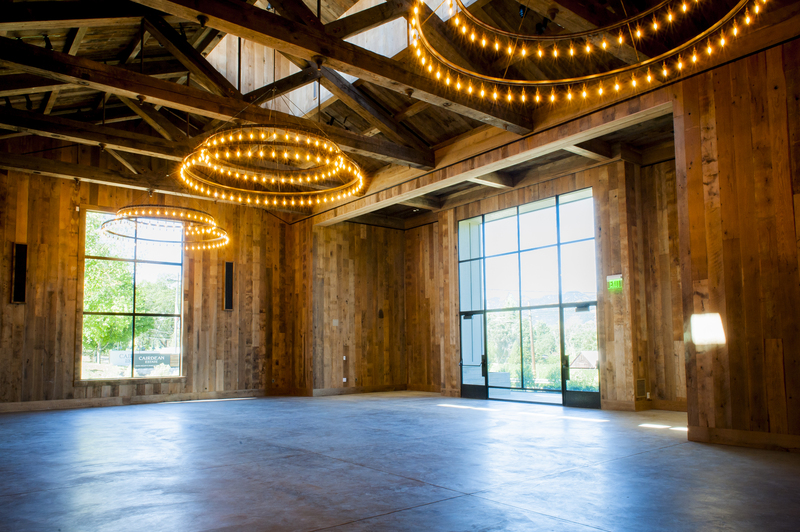 NapaShakes presents an exclusive Northern California engagement of the Shakespeare’s Globe Theatre of London in its enthralling and inventive touring production of William Shakespeare’s Much Ado About Nothing in the Barrel Room of the Culinary Institute of America at Greystone in St. Helena. Extremely limited seating available for only four extraordinary performances November 13-15, as this world-renowned troupe makes one of only two United States stops on its critically-acclaimed international tour. All tickets $65. Outstanding food & wine from the Culinary institute of America available; select tickets include a post-show meet-and-greet with the cast. CIA at Greystone Lunch & Dinner Packages were available for purchase with tickets! 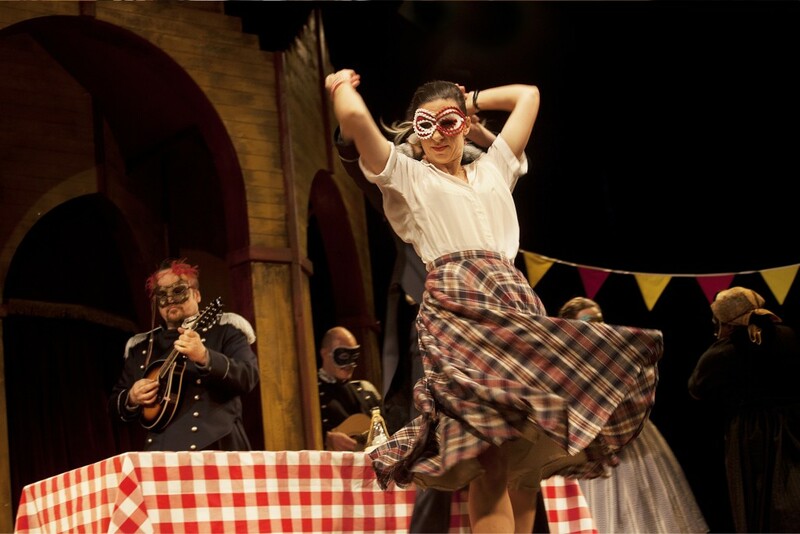 Directed by Max Webster, the Globe’s Much Ado represents a fresh, lively and thoroughly accessible rendition of one of Shakespeare’s most popular comedies. The production stars a cast of eight actors who are double, triple and quadruple-cast to play all the roles, and who are called upon to dance, sing, fight, tumble, and play musical instruments. Using an Elizabethan style booth stage – inspired by paintings and etchings from Shakespeare’s time when touring was prevalent – this fast paced adaptation breaks the boundaries between the stage and the audience in signature Globe Theatre style. This extraordinary theatrical experience will be paired with the exceptional food and wine of the Culinary Institute’s chefs and sommeliers, with special Shakespeare-themed lunch and dinner packages at the CIA’s acclaimed Wine Spectator Greystone Restaurant available for purchase, as well as pre-show concessions by CIA chefs and “Much Ado About Mead Wine” tastings in the Barrel Room, and wine and food tastings at the Sunday post-show cast reception. Shakespeare’s Globe Theatre is one of the world’s most revered and resourceful theatre companies, with its iconic open-air London theatre rebuilt nearby the site of Shakespeare’s original playhouse. It is currently touring Hamlet “Globe to Globe,” visiting every country in the world, while its touring company brings inventive, musically-charged productions to sold-out audiences at festivals and leading venues throughout the world. Its Broadway production of Twelfth Night & Richard III starring former Globe artistic director Mark Rylance earned multiple Tony awards and unprecedented critical acclaim, while shattering box office records. The Globe on Screen initiative is bringing Shakespeare captured live onstage in London in digital HD to cinemas worldwide. Learn more at www.ShakespearesGlobe.com. NapaShakes is a nonprofit dedicated to presenting year-round professional productions of Shakespeare and classical plays with a commitment to the highest level of quality, plus dynamic community outreach and educational programs. Tapping the wellspring of Shakespeare’s work, NapaShakes pairs the theatre’s greatest actors with the Wine Country’s most memorable wines, celebrated culinary delights, idyllic weather and spectacular stages to satisfy an audience as hungry for world-class theatre as it is thirsty for the Valleys’ legendary Cabernets. For more information about NapaShakes, visit www.napashakes.org. Much Ado About Nothing is wonderfully comical and enthrallingly dramatic. Claudio loves Hero and Hero loves Claudio, and it seems that nothing will keep them apart. Benedick loves Beatrice and Beatrice loves Benedick, and it seems that nothing will bring them together. Only the intrigues of a resentful prince can force Benedick to question his loyalty and prove where his love lies. 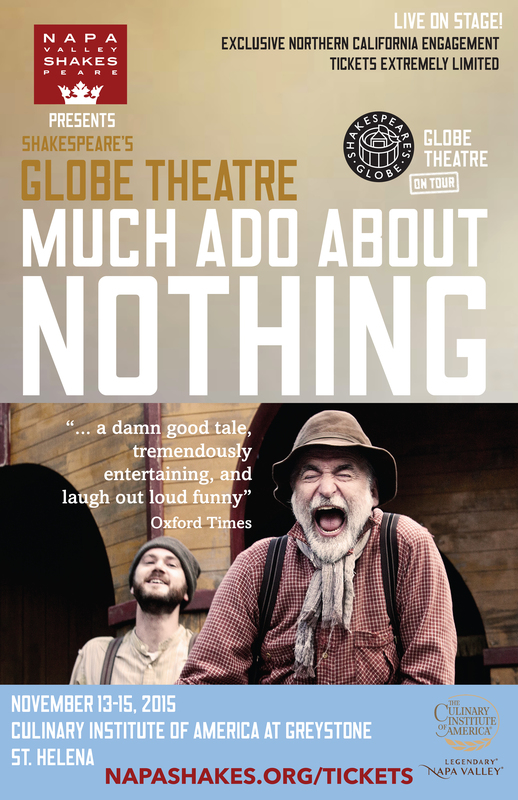 Its irresistible blend of comedy, romance and drama makes Much Ado About Nothing one of Shakespeare’s most captivating plays. In the bickering and bantering of its leads, Shakespeare gives us some of his sharpest and most witty dialogue, and one of the most beguiling of all romances. 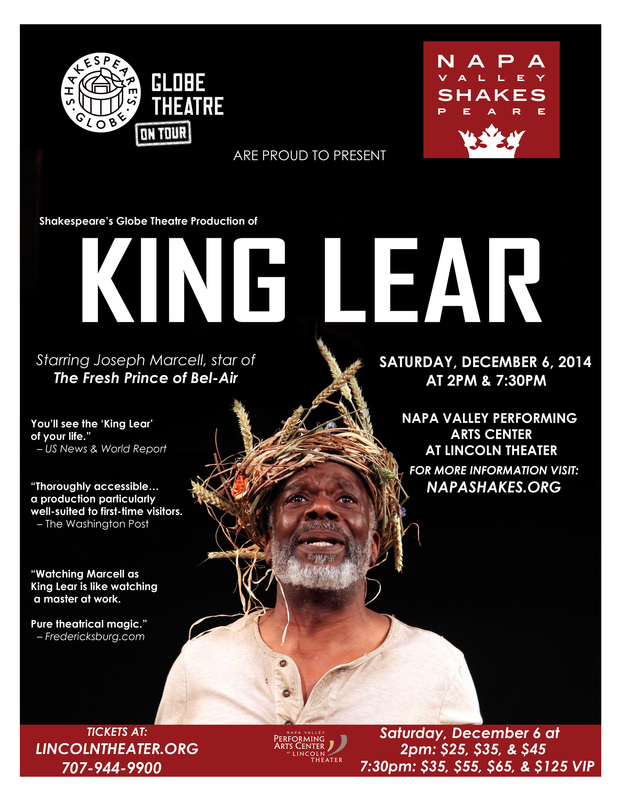 NapaShakes launched by presenting the internationally-renowned Shakespeare’s Globe Theatre in its critically-acclaimed production of King Lear, for two performances only on December 6, 2014. This daring and inventive troupe from England, lauded for its legendary Twelfth Night/Richard III Broadway run, ended its two-year world tour with this final engagement. 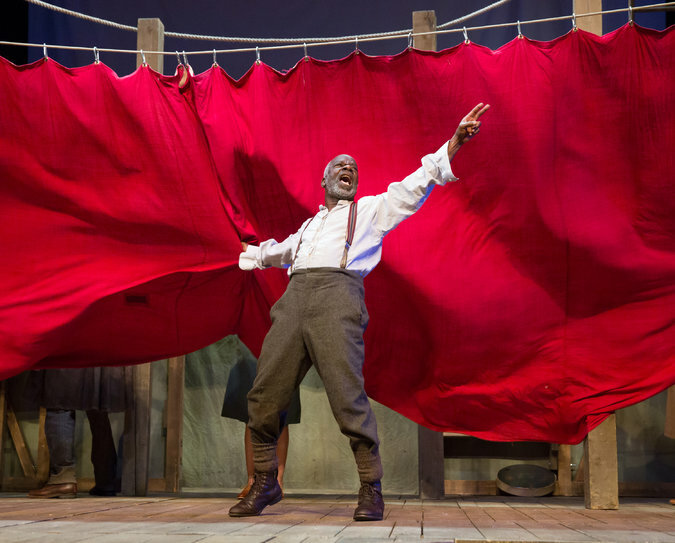 Staged with thrilling physicality and raw emotion by 8 actors playing multiple roles, it starred British actor Joseph Marcell, best known here for his role on The Fresh Prince of Bel-Air. 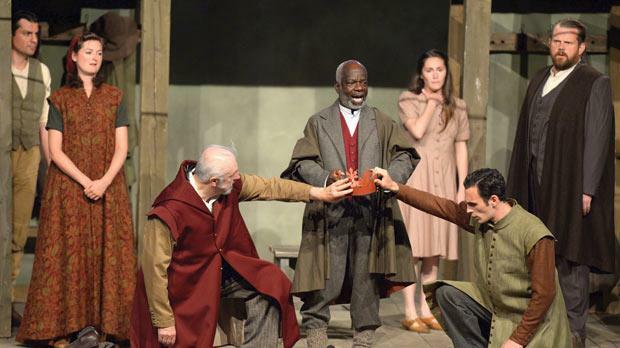 With tempestuous poetry shot through with touches of humor and moments of heart-rending simplicity, King Lear is one of the deepest artistic explorations of the human condition. Check out our Education page for photos of our special King Lear school show, where 1100 Napa Valley school kids got to see a special version created for them by the Globe – for free!